Now is the time for setting seeds in pots so they will be ready to plant when your garden spot is ready. We have the individual 3 " fiber pots with a Seeding & Cutting Mix to get your seeds started! NEW THIS YEAR: WILDFLOWER MIX PACKETS (2 ounces) available in MIDWEST WILDFLOWER MIX (Native to our area), BUTTERFLY FLOWER GARDEN MIX (To attract many species of butterflies), HUMMINGBIRD FLOWER GARDEN MIX (Provides tremendous color impact and produces lots of nectar), and BEE POLLINATOR WILDFLOWER MIX (mix of perennial wildflowers and native grasses provides a ready food source to bees and other beneficial pollinators). Participate in the Million Pollinator Garden Challenge - register through www.millionpollinatogardens.org, a non-profit organization. We carry Olds Garden Seeds which are only sold through independent garden retailers nationwide. The Olds' brand dates back to 1888, when Levitt Lincoln Olds founded the L.L. Olds Seed Co. at Clinton, WI. Through the years, Olds became known for selling only the finest quality seed of better varieties, whether selling alfalfa and seed potatoes for Wisconsin farmers or garden seed through a mail order catalog for 100+ years. We sell Olds seed by the packet and in bulk. We sell in bulk to save YOU money! For example, a packet of $1.99 beans is around $.30 in bulk seed pricing. Our seeds arrived mid-March and are available until mid-September. We stock in seeds: Asparagus, Beans (green, wax), Beets, Brussel Sprouts, Carrots, Cucumber, Endive, Herbs (Basil, Dill, Rosemary), Kale, Kohlrabi, Lettuce, Onion, Parsnip, Peas, Popcorn, Pumpkin, Radish, Rutabaga, Spinach, Squash, Swiss Chard, Watermelon. Others are special order depending upon availability. Olds Garden Flower seeds are available in: Aster, Cosmos, 4 O'Clocks, Larkspur, Morning Glory, and Sunflower. Our potatoes and onions will be arriving shortly for the season. They fly off the shelves fast, so get them before they are gone! Sets - We offer white and yellow onion sets and are sold by the pound. Plants - We offer a red, a vidalia type, and a yellow sweet spanish (our most popular!). Plants bundles range from 30-50 onions per bundle. Kennebec - (medium late white) - Oblong white tubers. Cooks and bakes wonderfully. One of the best for winter storageGold Rush (russet) - Long, russet-skinned spuds with bright white flesh are good bakes, broiled for fried! Resistant to hollow heart scab. Norland - (early red) - White flesh of highest cooking quality; stores well. Pontiac - (medium red) - An excellent all purpose potato; stores well. Yukon Gold - (early-midseason yellow) - Butterly yellow flesh; sure to be a hit no matter how you serve them. Stores very well. 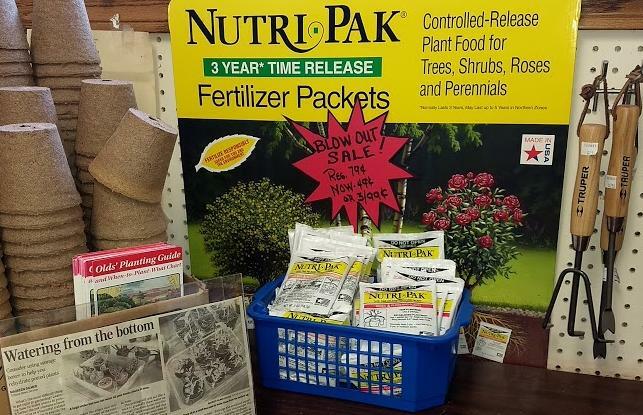 For your gardening supplies, we carry gloves, rakes, shovels, and sprayers for our liquid products. 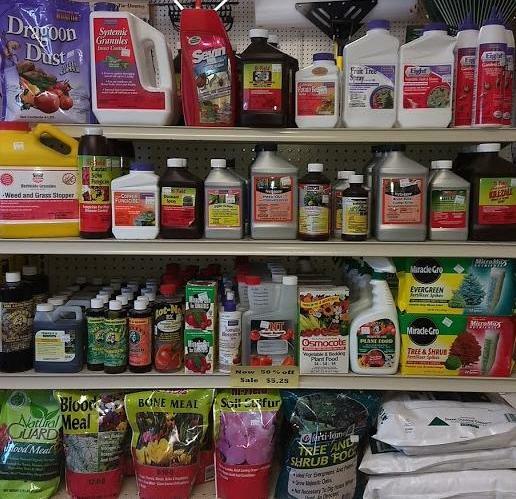 weed & grass killers/preventers, Diatomaceous Earth, and several items specific to enhance your tomatoes.